It took just forty-five minutes for the league’s top striker to show why he is League1’s most dangerous player with the ball at his feet in front of net. Toronto FC Academy’s Molham Babouli didn’t enter Sunday’s match at Kia Training Ground until the start of the second half, with the score just 1-0 for his side over ANB Futbol. But when it was over, he’d scored three very impressive goals and the final was 6-1 for his club. Babouli, who now has an impressive twenty-one goals to put him well in front of all others in the inaugural season of League1 Ontario competition, scored once from open play, blasted another rocket from the penalty spot, and ripped a third unstoppable shot from a free kick. He was a force that couldn’t be reckoned with by an ANB squad that didn’t know what hit them in the second half. For Babouli it was all in a day’s work. “It feels good to excel, it always feel good, definitely,” said Babouli, of his ability to find the net. He said he doesn’t particularly work on his free kicks or penalty shots, but felt like the right player in the right spot on Sunday. “Whoever’s feeling confident, just steps up and takes it and hopefully it goes in,” he said. 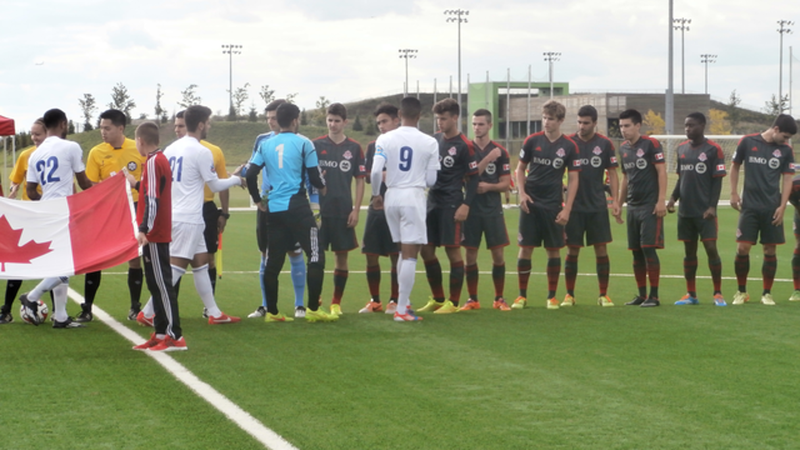 Sunday’s victory gave TFC Academy a five-point cushion over second-place Vaughan Azzurri, with the leaders now on thirty-first points after thirteen games played. Vaughan has also played thirteen games. Sigma are a point behind Vaughan with thirteen games played, while Woodbridge are in fourth on twenty-two points, having played only eleven games. Aidan Daniels scored a pair of wonderful goals for the Academy, one in each half to add to Babouli’s hattrick, while Stefan Vukovic on a chip of keeper Ali Ghazanfari, who had little chance on any of the goals, scored the other TFC tally. Belrum Vartanian had the lone ANB marker from the penalty spot, but the score was 5-0 for the home side at that point in the contest. Michael Calder was sent off for ANB in the eightieth minute, after he was yellow-carded for pushing a TFC player, then argued with the ref and was red-carded dropping his team to ten men. ANB sits seventh of nine teams with twelve points, four behind Masters FA Saints. ANB has four games left. They face Durham FC United in their next match, Friday at Kinsmen Park in Pickering at 8 p.m. The next contest for Toronto FC Academy in a very busy week is a makeup game with Woodbridge Strikers on Wednesday evening at Vaughan Grove Park at 7 p.m.